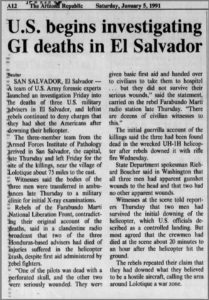 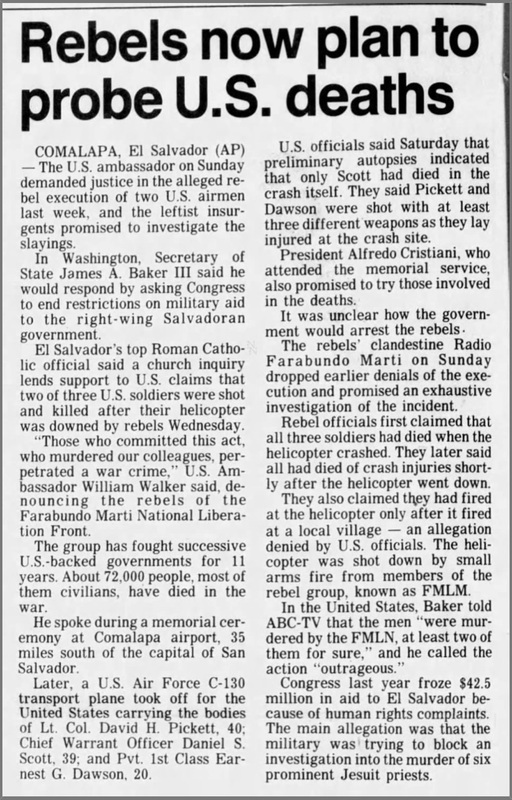 Near the waning years of the Central America War, in the early morning hours of January 2, 1991, 228th Aviation 4th battalion commander LTC David Pickett, helicopter pilot CWO4 Daniel Scott and crew chief PFC Earnest G. Dawson departed Soto Cano Air Base, Honduras for El Salvador. 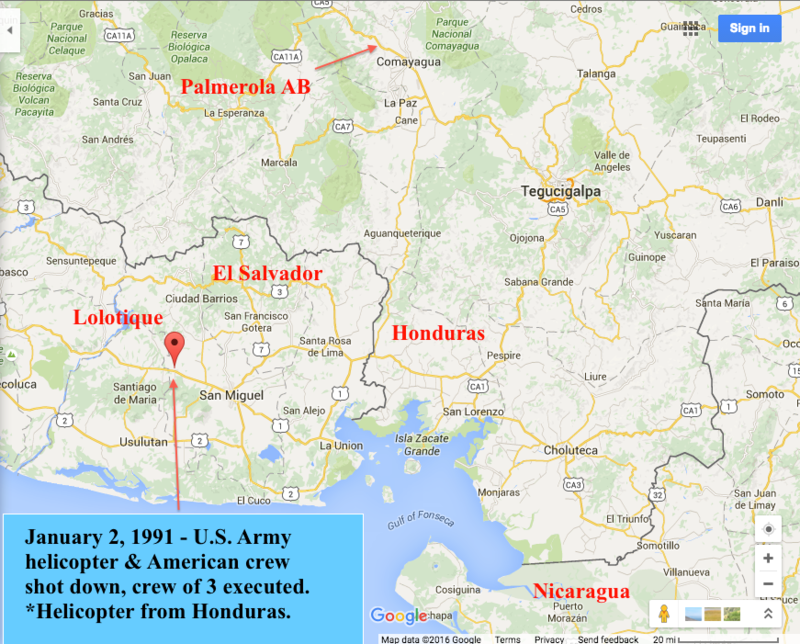 Their route would take them along the Pan American highway across the border. 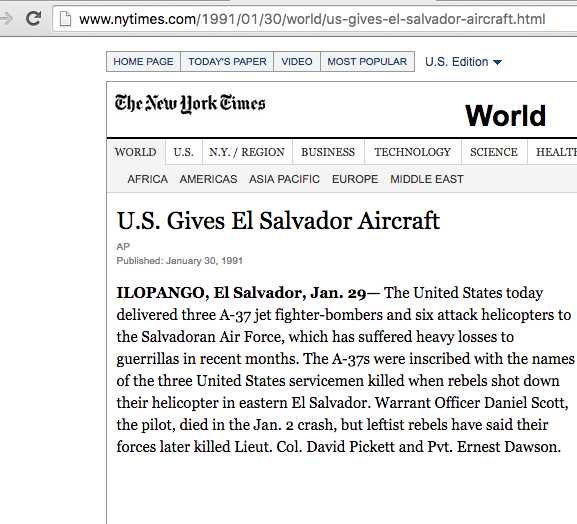 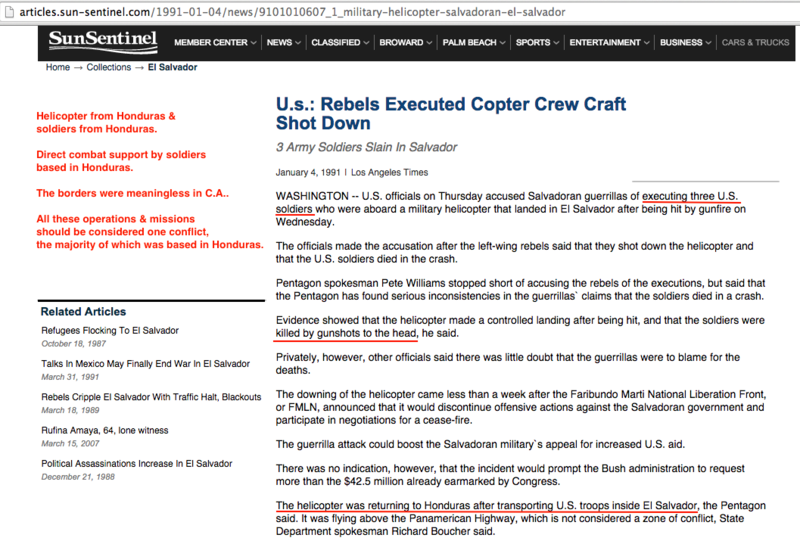 After dropping off troops at San Salvador, El Salvador, they headed back to home base at Soto Cano Air Base, Honduras. 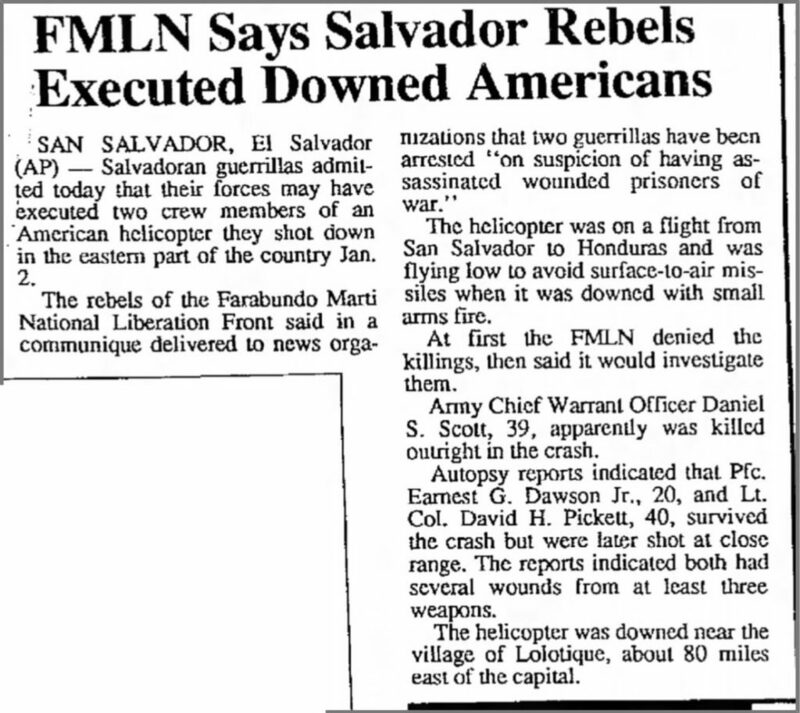 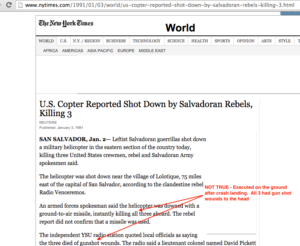 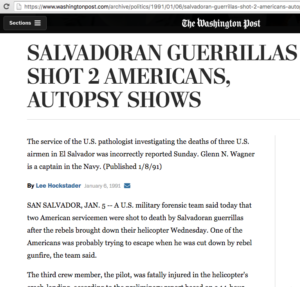 Near Lolotique, El Salvador, not too far from the Honduran border, they encountered enemy small arms fire. 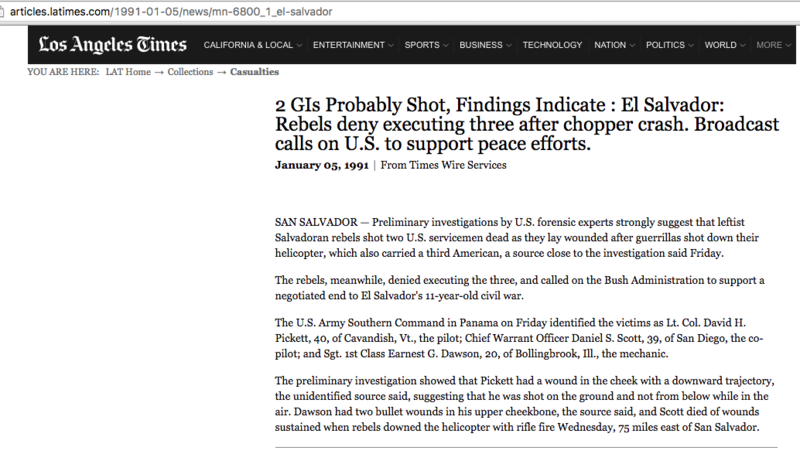 CWO4 Scott was killed instantly while piloting. 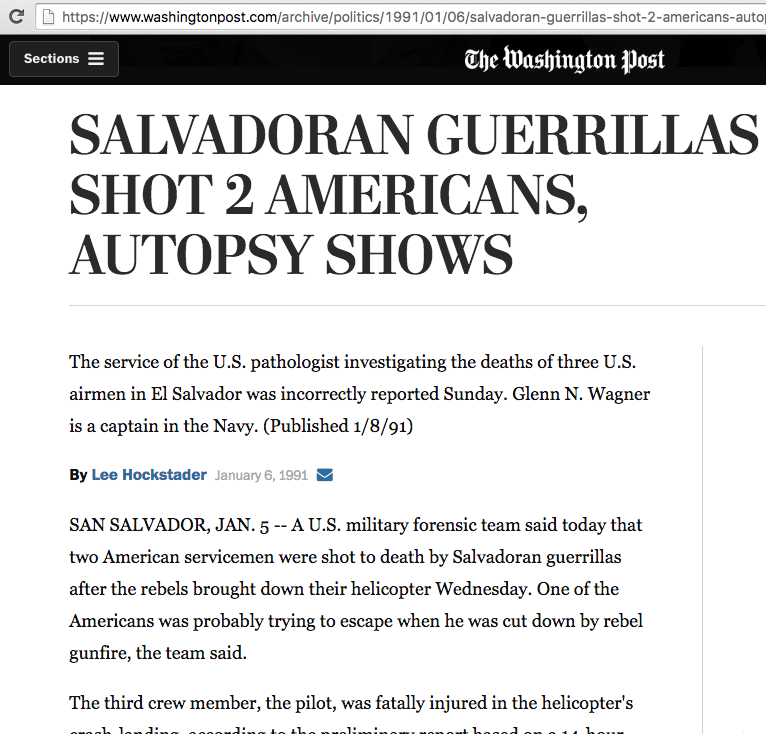 Some reports claim that he died on impact. 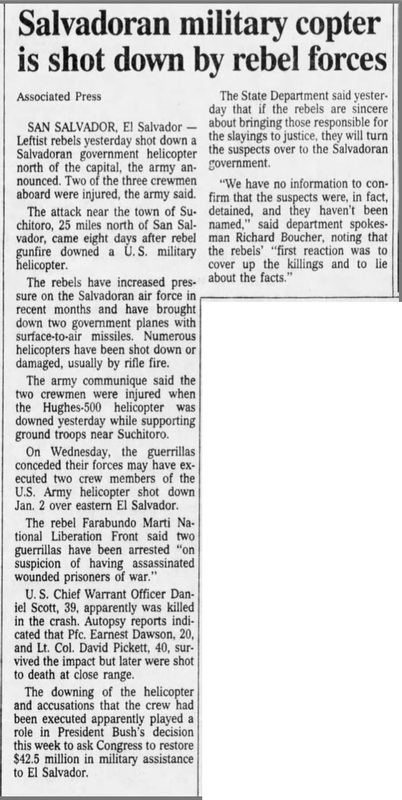 Other reports stated that PFC Dawson was firing his mounted M60 at enemy insurgents. 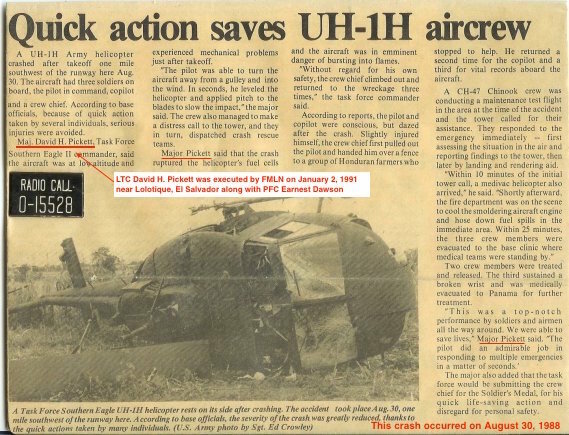 LTC Pickett, a seasoned helicopter pilot, immediately assumed control of the copter and miraculously auto rotated it down into a controlled crash landing. 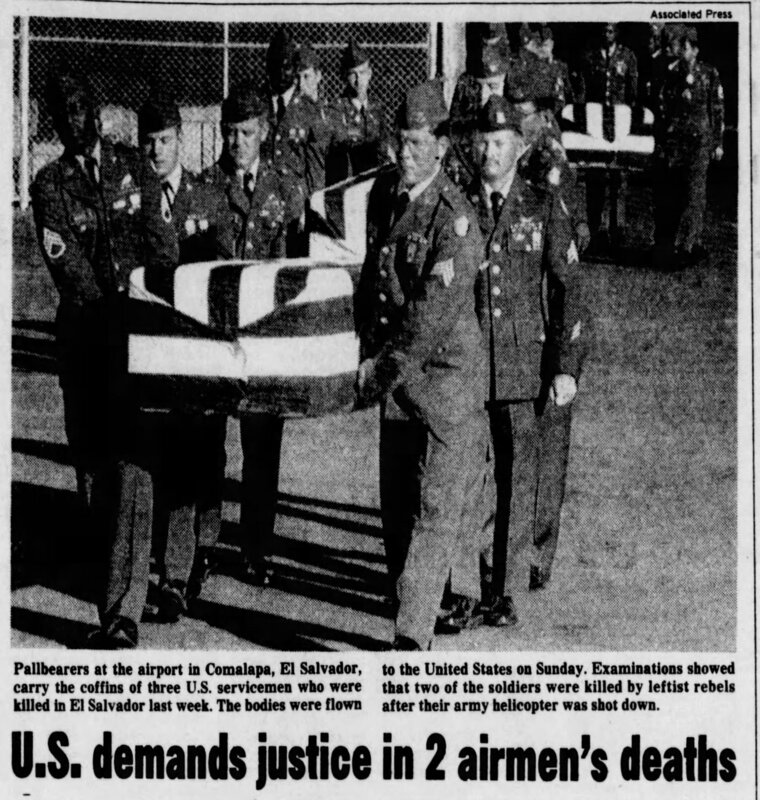 LTC Pickett survived the crash landing with minor injuries, while PFC Dawson sustained serious, but non life threatening injuries. 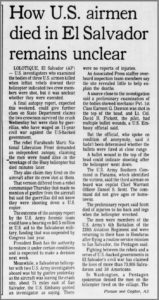 Shortly after the crash landing, LTC Pickett was seen walking around surveying the wreckage looking for the first aid kit and some water for Dawson. 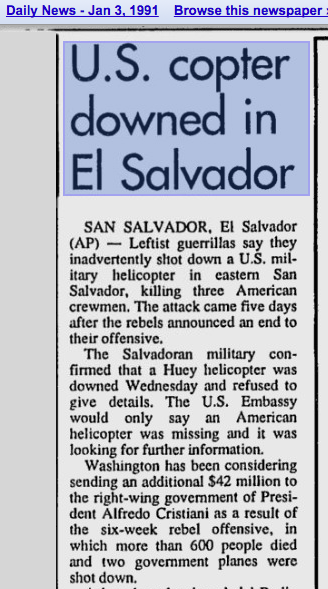 Within minutes, armed members of a communist insurgent guerrilla group surrounded the Americans. 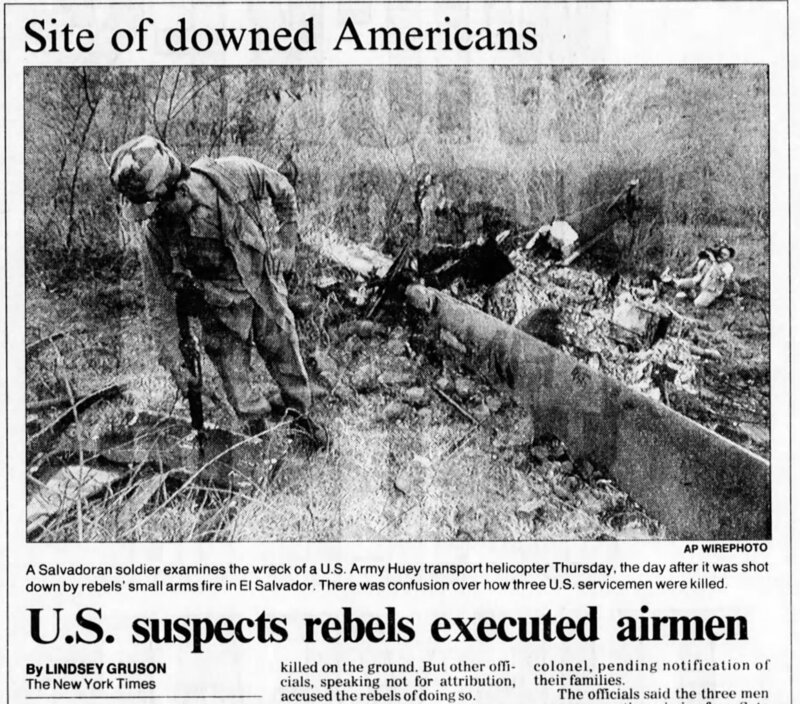 Moments later local villagers wondered upon the crash site. The guerrillas collected the soldiers weapons. 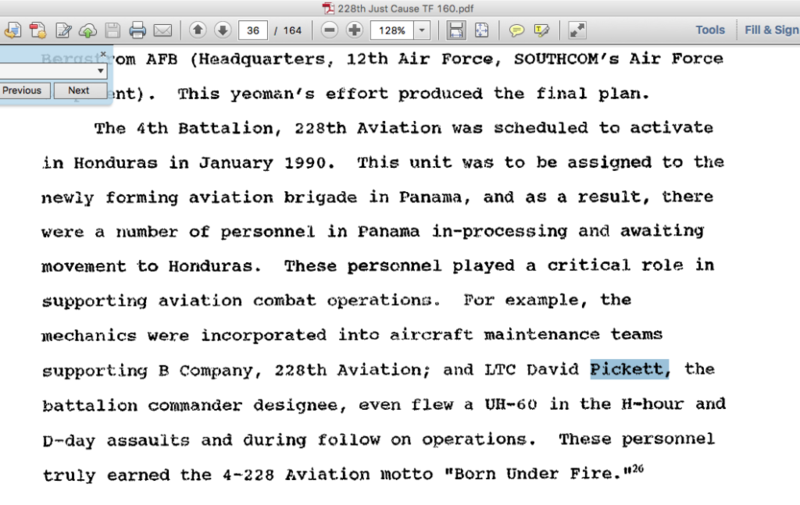 LTC Pickett reportedly requested water for PFC Dawson. 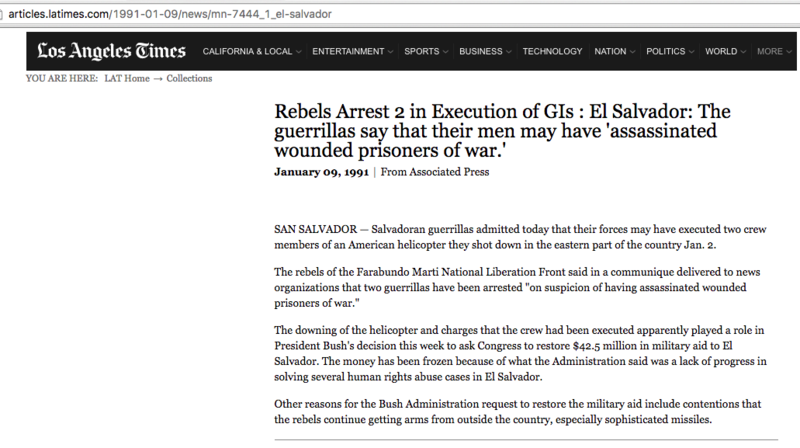 Not knowing what to do, the guerrillas radioed their superiors. Pickett and Dawson were taken prisoner and ordered to knell with their hands above their heads. 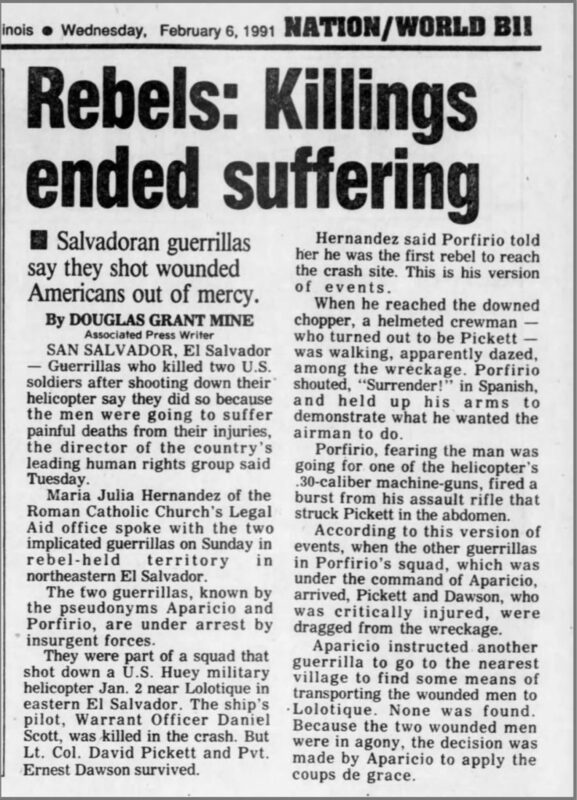 After a period of roughly an hour, the guerrillas directed the local villagers to fetch some water over some nearby hills. Another hour had passed as the guerrillas waited for the villagers to vanish from sight over the small mountain top. 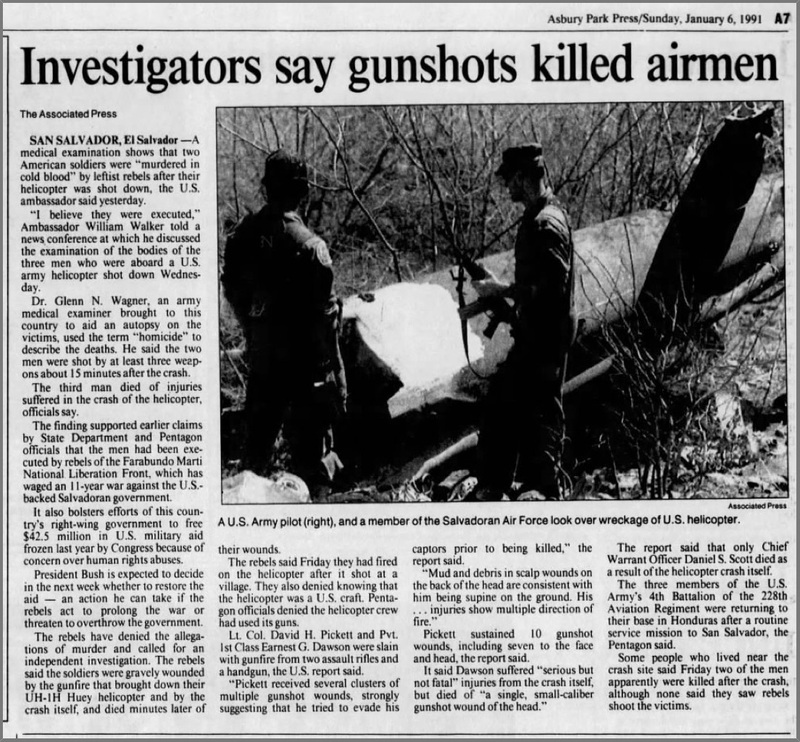 The villagers later heard gun shots coming from the direction of the crash. 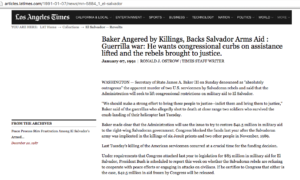 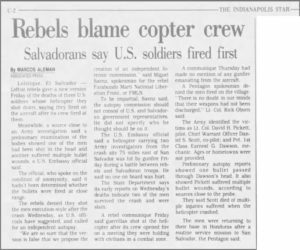 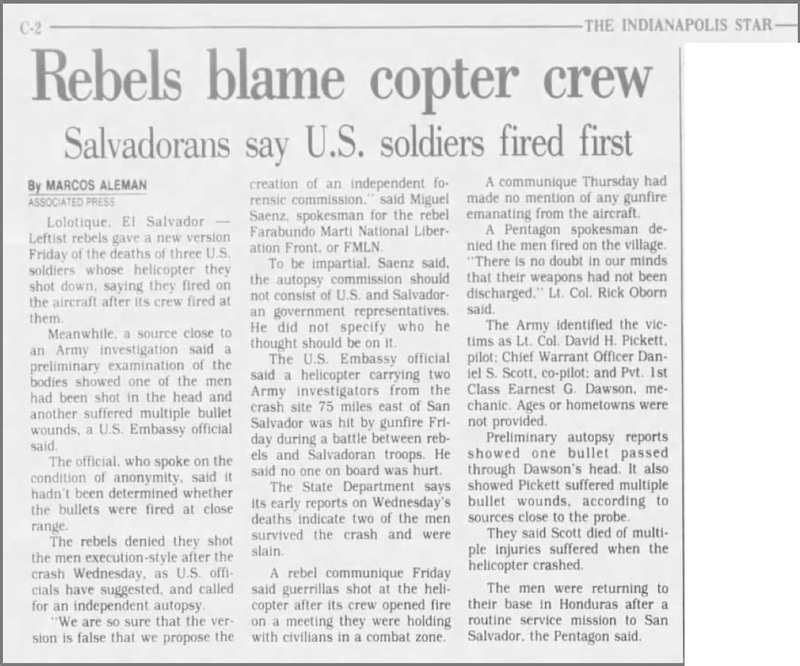 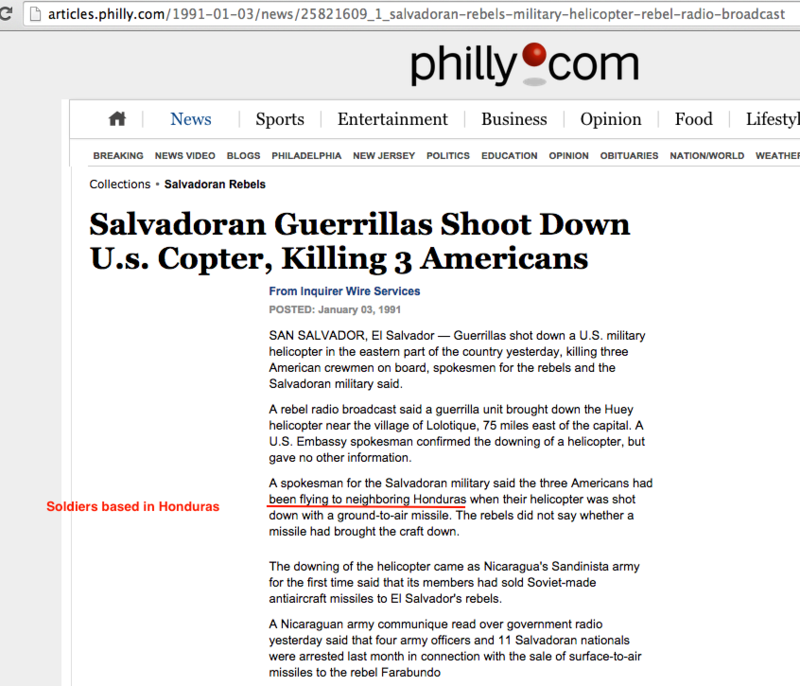 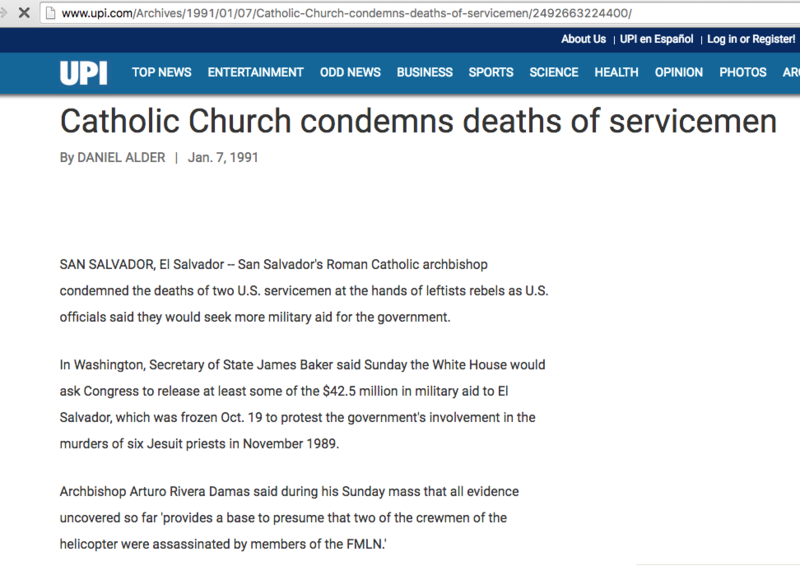 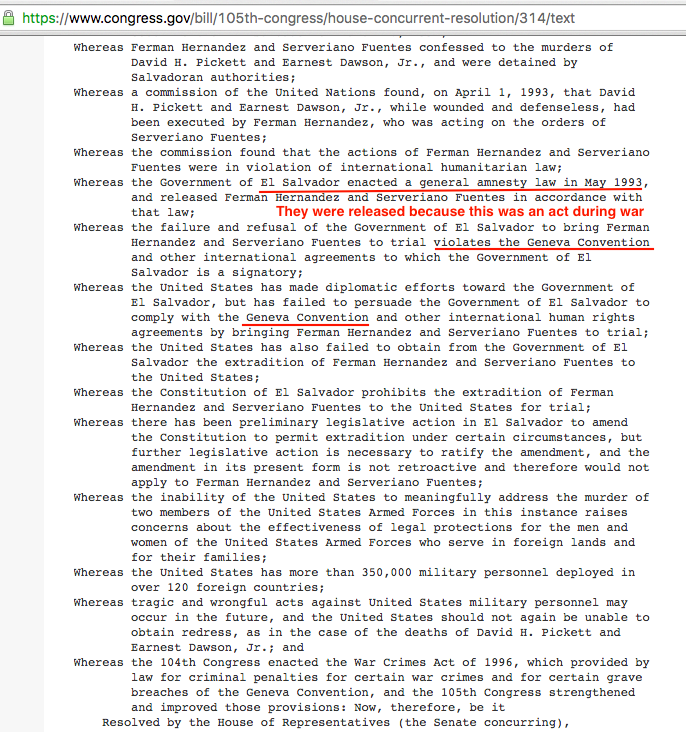 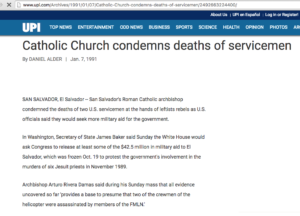 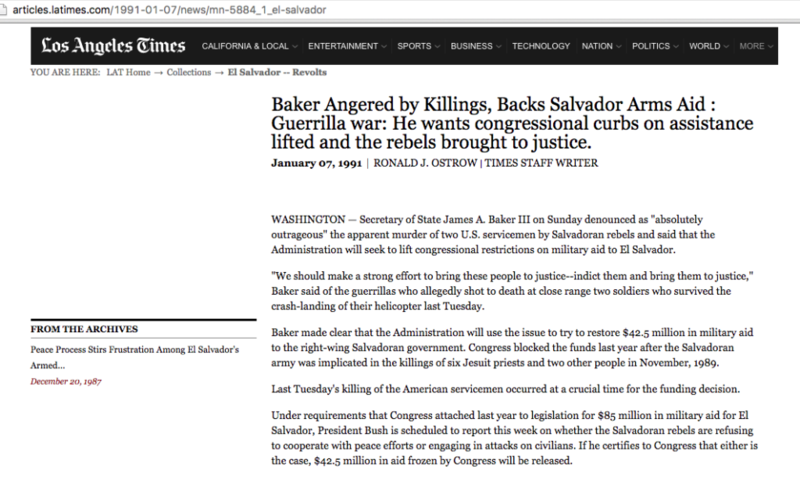 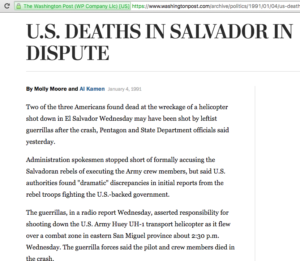 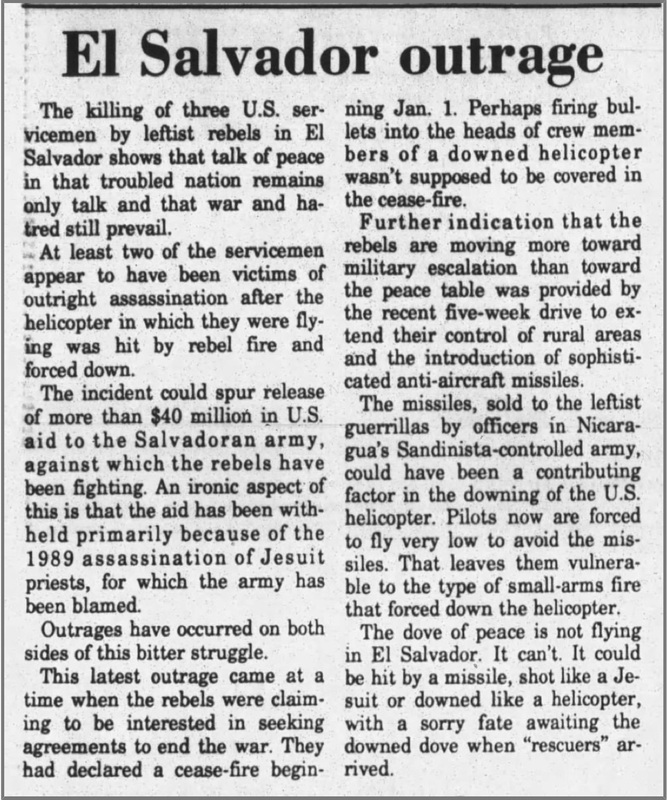 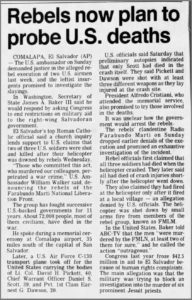 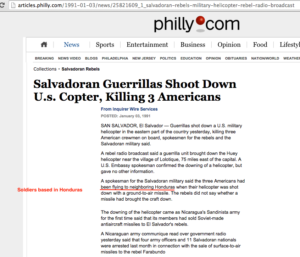 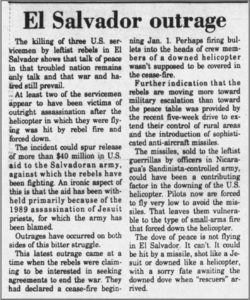 The U.S. Congress protested siting the Geneva Convention articles for which the Salvadoran guerrillas claimed they were a signing party. 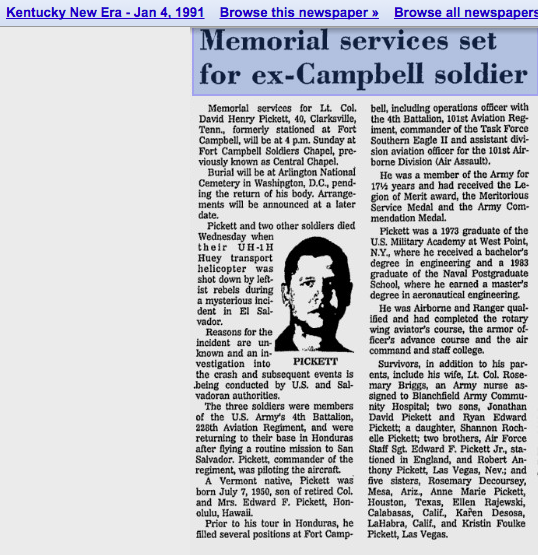 LTC Pickett’s father, a retired Army Colonel, fought long and hard requesting proper recognition for his son David and in 2003, LTC Pickett was eventually awarded the Prisoner of War Medal posthumously. 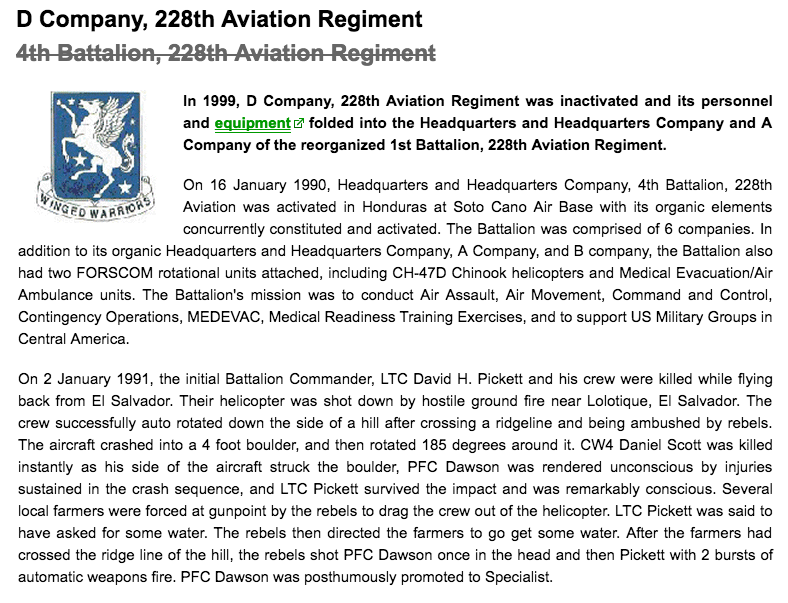 LTC Pickett was also awarded the Distinguished Flying Cross for landing the craft in a manner that saved PFC Dawson’s and his own life. 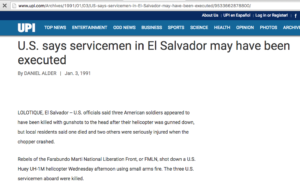 All three were awarded Purple Hearts and Air Medals. 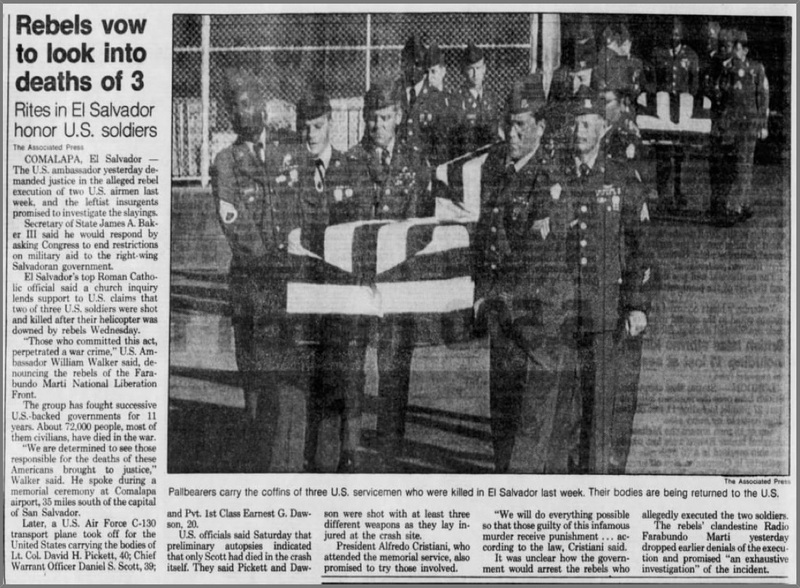 PFC Earnest G. Dawson was posthumously promoted to Specialist 4. 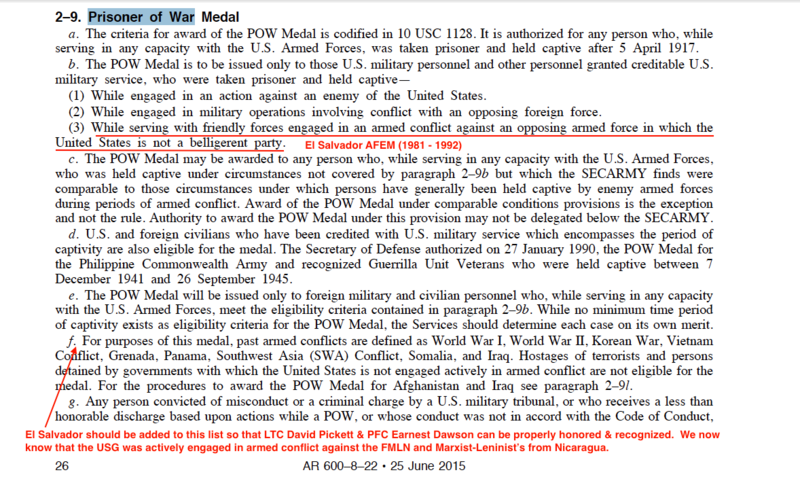 SP4 Earnest G. Dawson has not been awarded the Prisoner of War Medal. 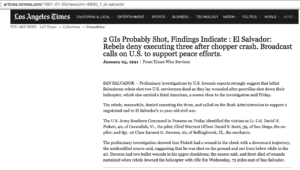 CWO4 Scott’s death is listed as an accident in the Defense Casualty Analysis System. 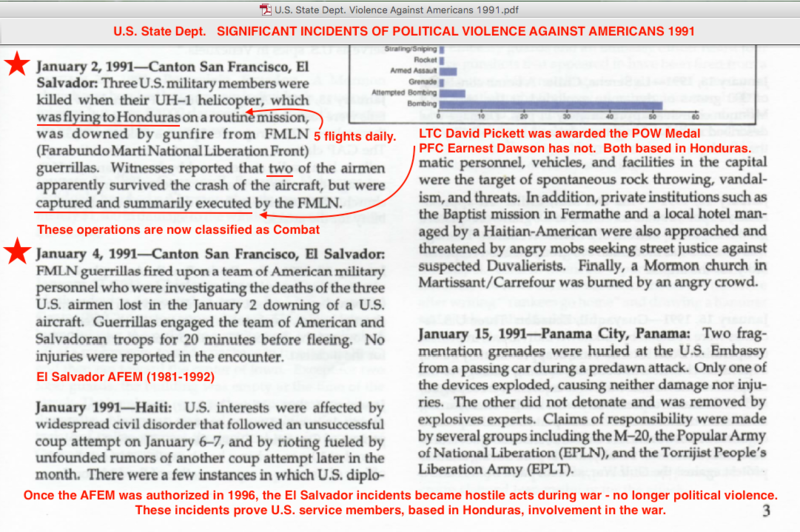 The Pentagon determined that LTC Pickett and SP4 Dawson’s deaths were by criminal homicide. 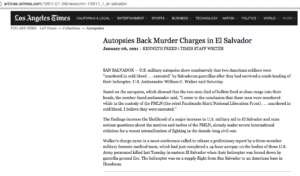 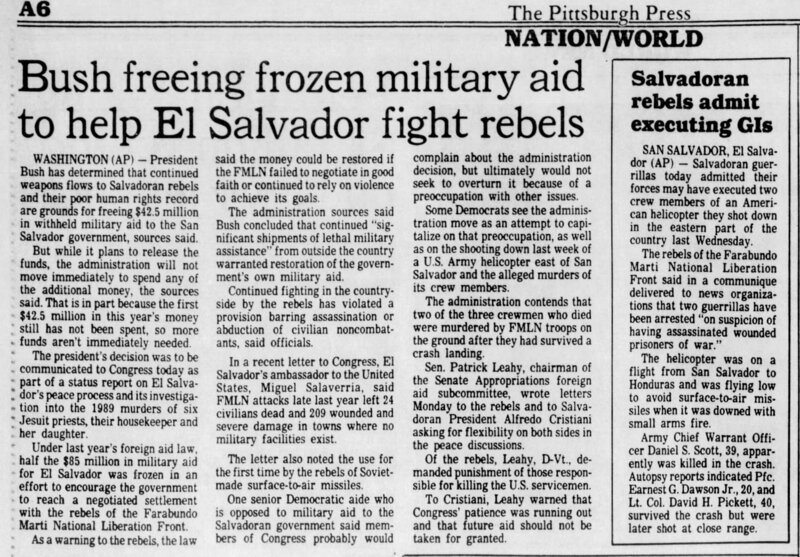 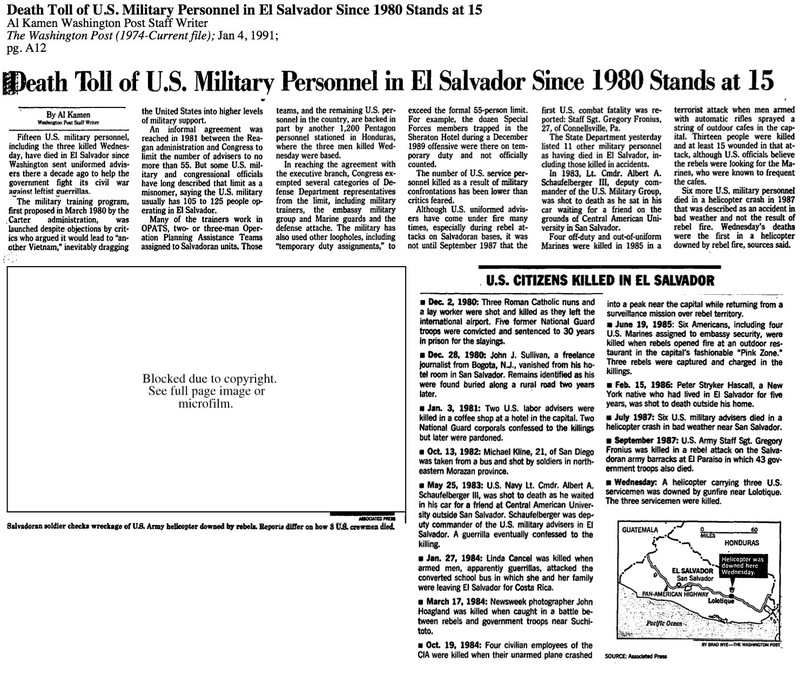 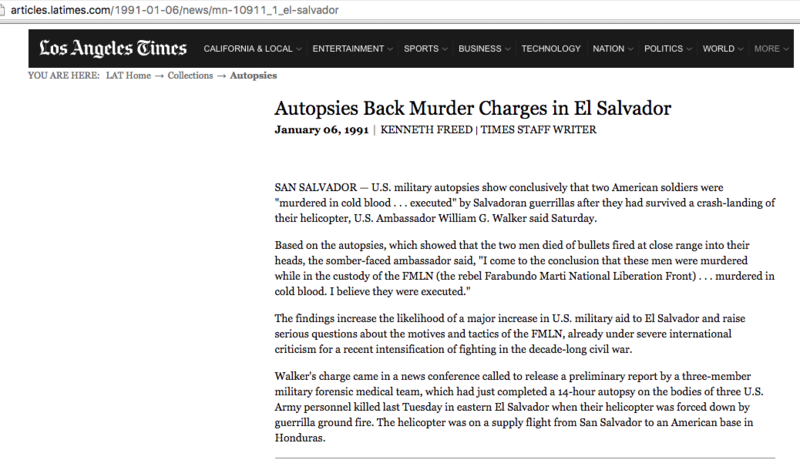 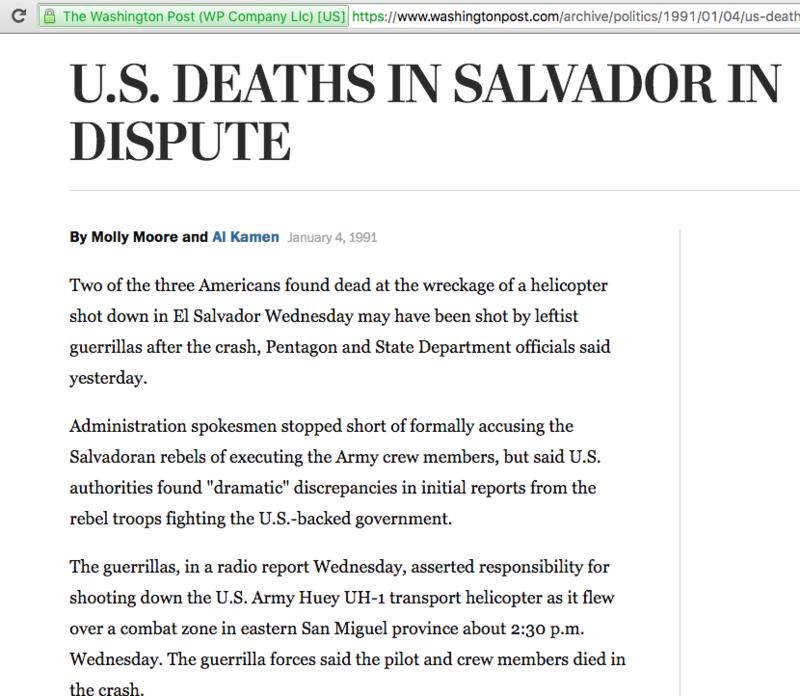 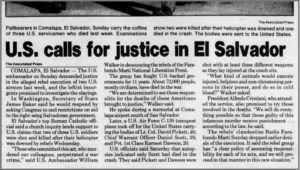 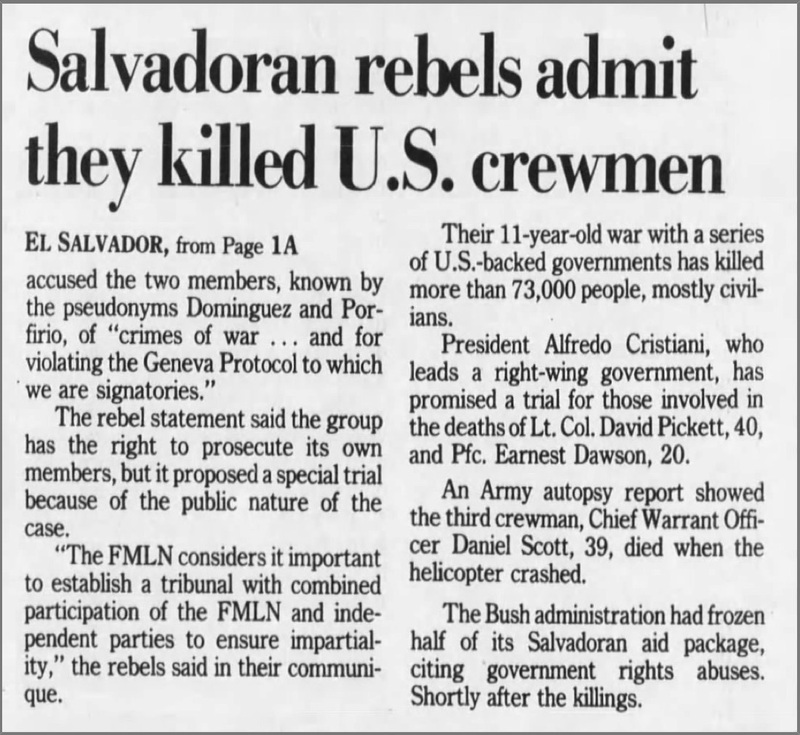 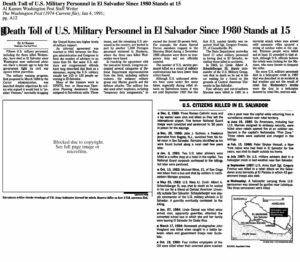 Once President Clinton authorized the Armed Forces Expeditionary Medal in 1996 for service in El Salvador from 1981 to 1992, these ‘criminal acts’ became acts of war. 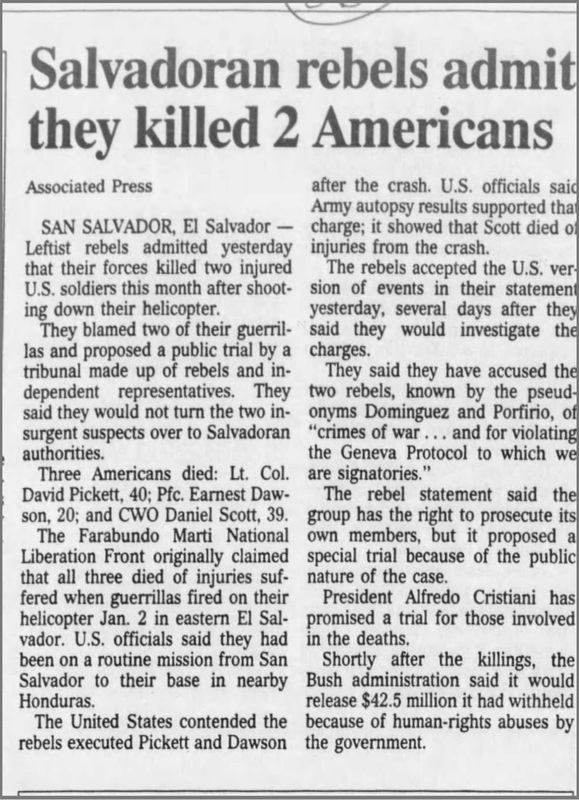 This also is why the two accused were never released for prosecution in the U.S.. These classifications should be changed to killed in action. 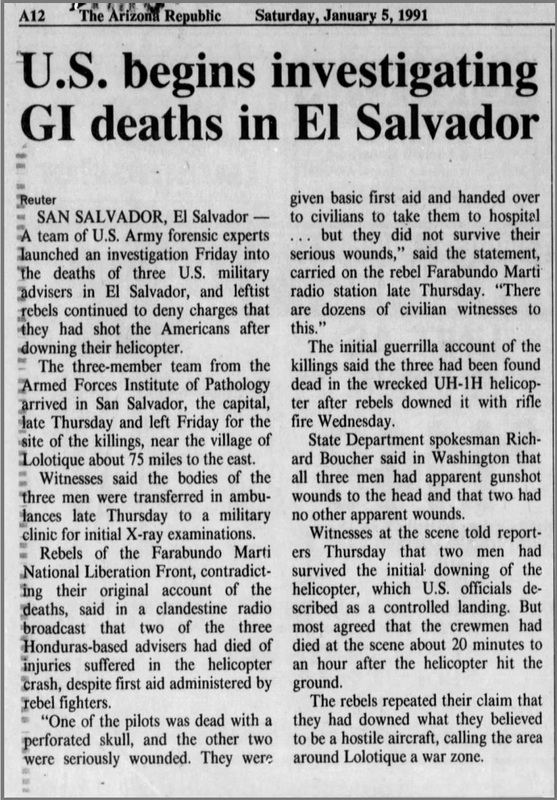 All three were based in Honduras conducting combat support operations into El Salvador. 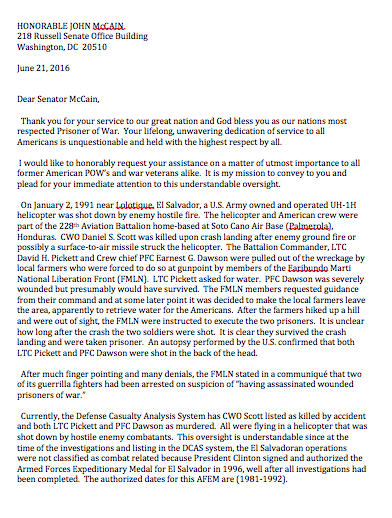 UPDATE – Senator John McCain letter awaiting response. 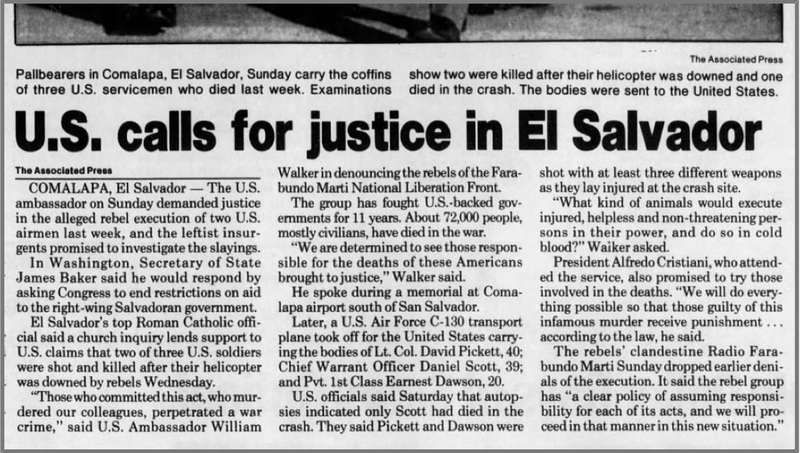 Letter sent on June 21, 2016, received by his D.C. office on June 23, 2016 requesting his assistance in seeking the POW Medal for SP4 Earnest G. Dawson for being executed as a wounded POW near Lolotique, El Salvador by communist rebels on January 2, 1991. 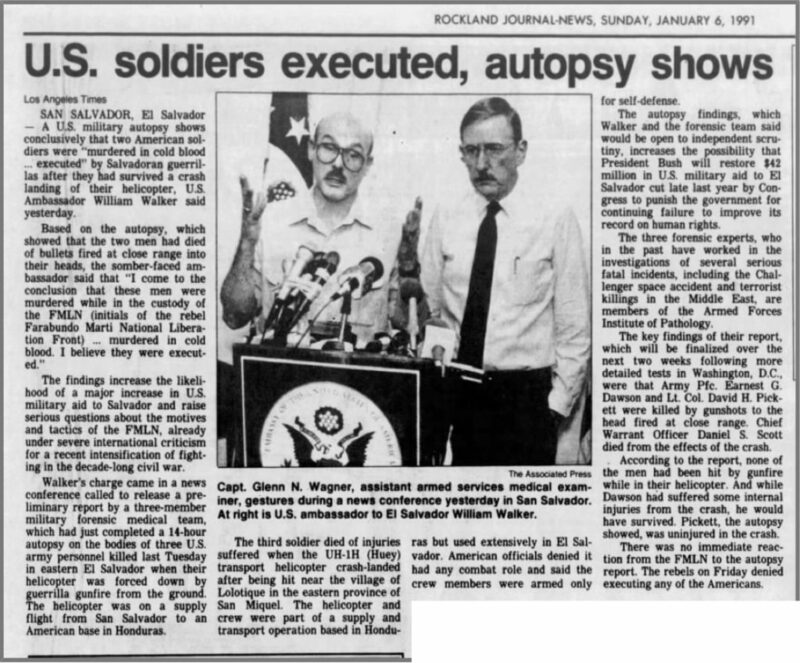 Dawson and his battalion commander LTC David Pickett were both knelling next to one another when they were executed as Prisoners Of War. 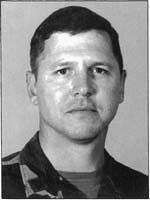 LTC Pickett received the POW Medal in 2003 posthumously. 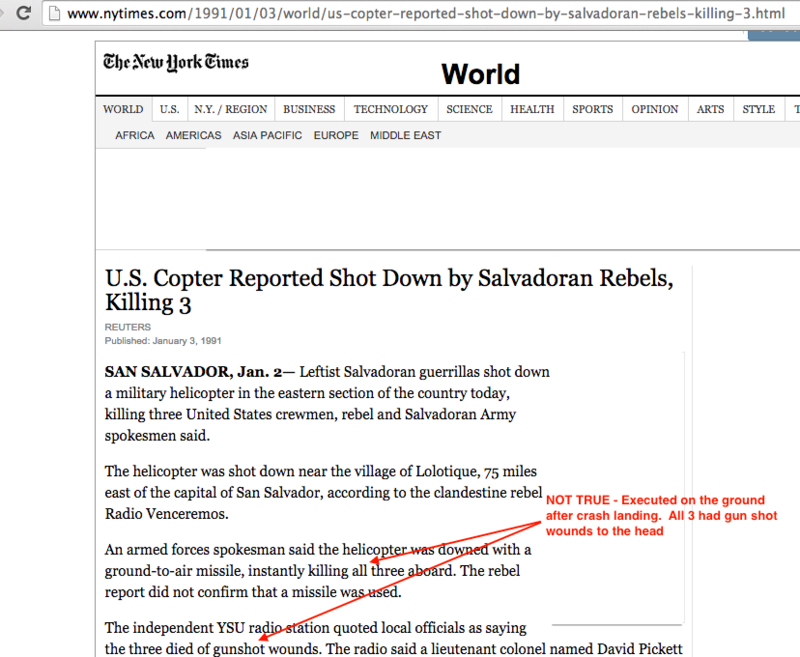 SP4 Dawson has not. 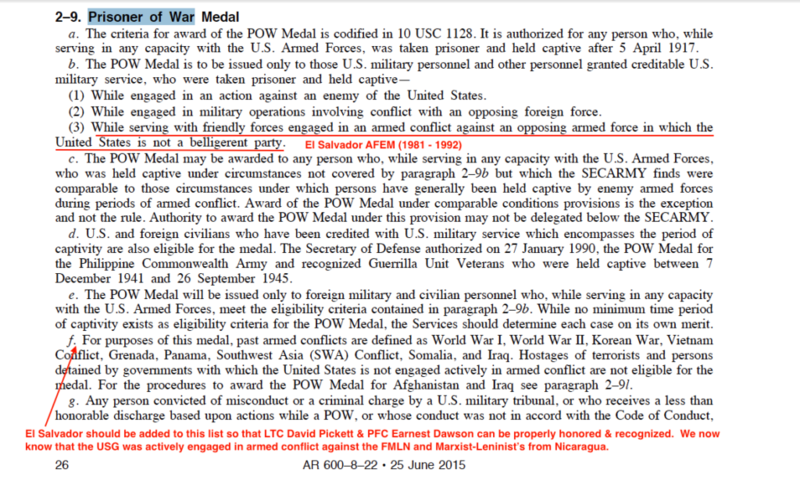 Please join USContraWar in sending a letter to Senator John McCain or your U.S. Congressional Representative to ask for help in seeking proper POW status for SP4 Dawson and his family. 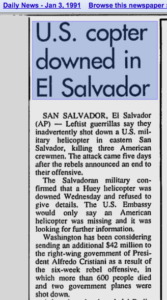 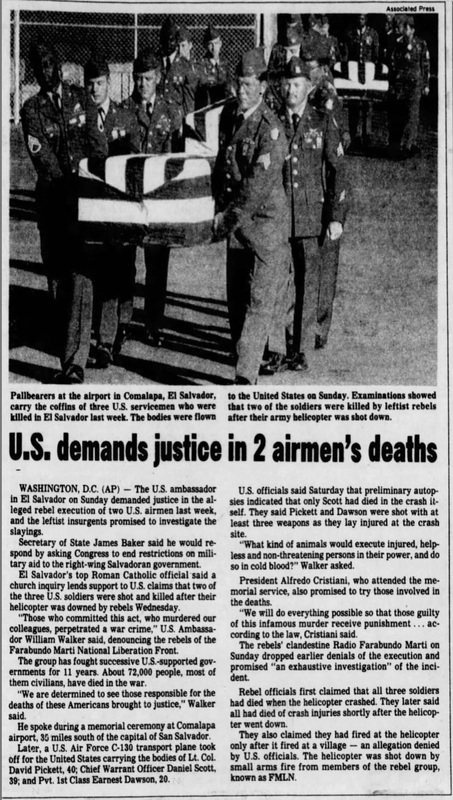 Both were stationed in Honduras and were on a direct combat support mission to El Salvador on the return flight to Honduras when their helicopter was shot down. 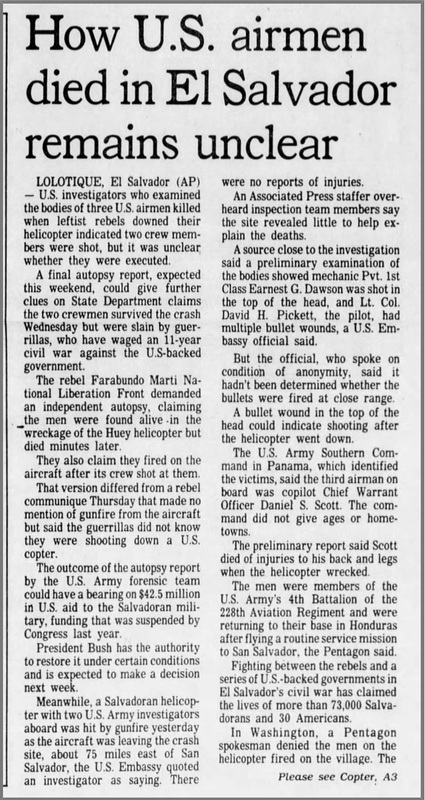 Pilot CWO4 Daniel Scott was instantly killed by small arms fire. 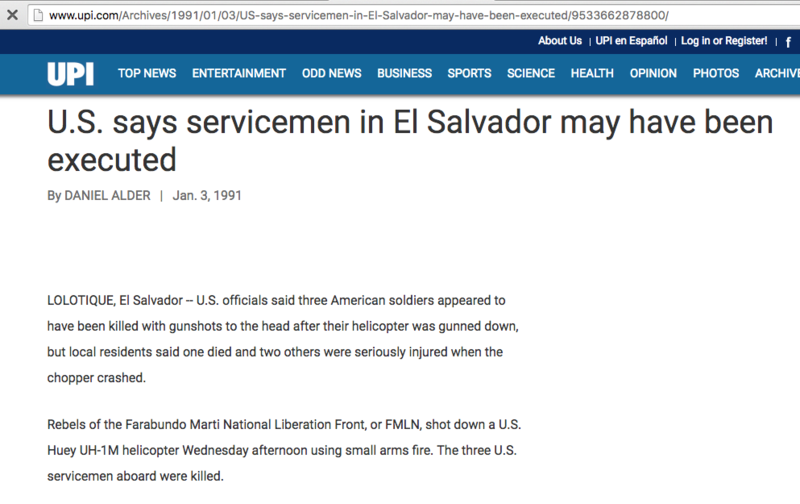 All received Purple Hearts and Air Medals. 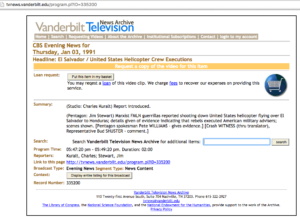 Pickett received the Distinguished Flying Cross for saving Dawson and his own life by safely landing the craft. 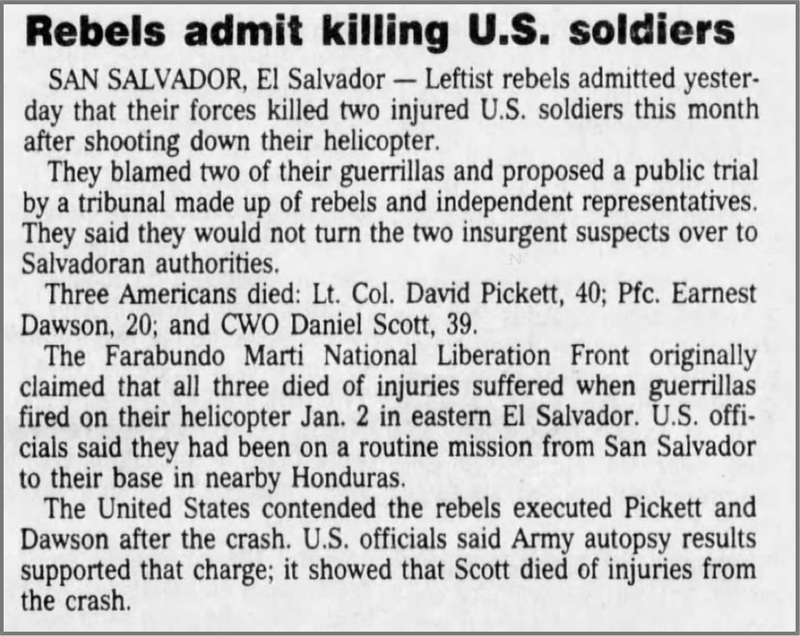 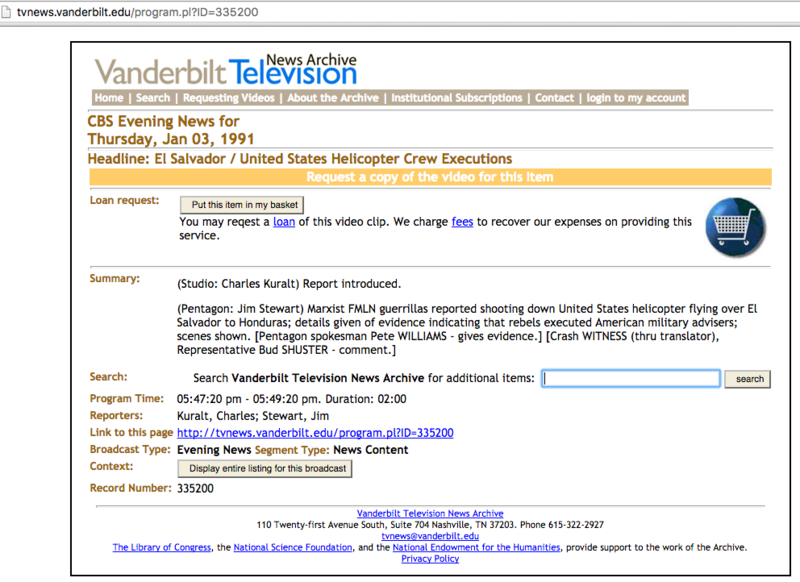 The Pentagon has Scott’s death listed as an accident, Dawson and Pickett’s deaths are listed as homicide-all during peacetime? 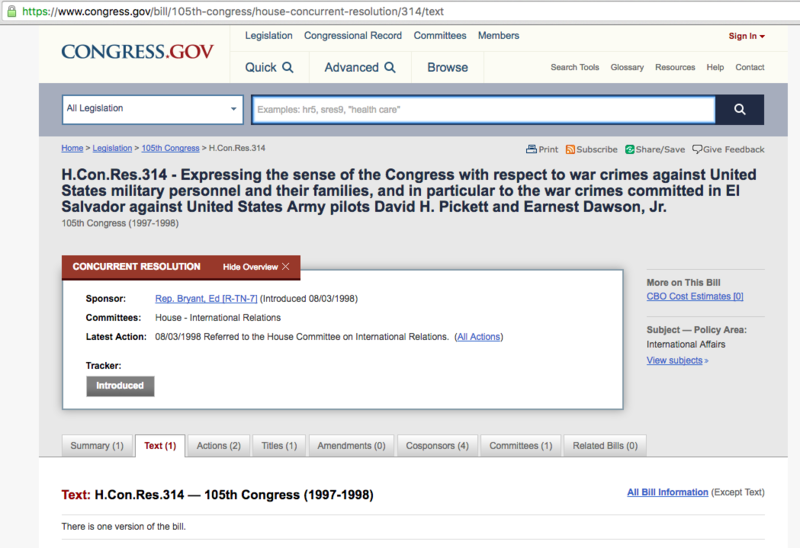 Please help ensure that Congress hears this loud and clear. 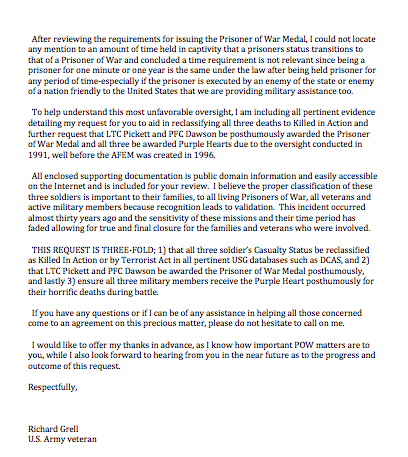 When this letter was written, it was not known by this author that LTC Pickett was posthumously awarded the POW Medal in 2003.